Github is probably the most influential company you haven’t heard of. Unlike Google or Facebook, companies that make it into the headlines occasionally, Github tends to stay out of public view. But in many ways it is comparable to these tech giants in that it has contributed to thousands and thousands of products that you probably use every day. How, you ask? Well, by providing a platform for individuals and companies to get the “crowd” to help develop new ideas resulting in crowdsourced content. Just to give you a sense of how significant the platform is, it’s webpage is the 83rd most popular website in the world. That is especially impressive considering that it is one website (among billions) that is dedicated not to broad internet tastes (cat videos or conspiracies), but to a specific niche: helping developers pool their talents to solve a problem. With Github a company can rally many more people than would otherwise be working on a problem before in a company, granting them access to hundreds of thousands of people who want to be part of the solution. The best part, all this help is … free. That’s right, in many cases, developers are not being paid to work on a project. They do it for the greater good, and for the acknowledgement that they get from their peers. As the Github case exemplifies, engaging the crowd exponentially increases the perspectives on a particular issue, it aggregates expertise and it takes a lot of the work burden off of the original author’s shoulders. It also accelerates the creation process and makes it scalable – whatever a person was doing on their own, can now be magnified by the efforts of the people in the crowd. 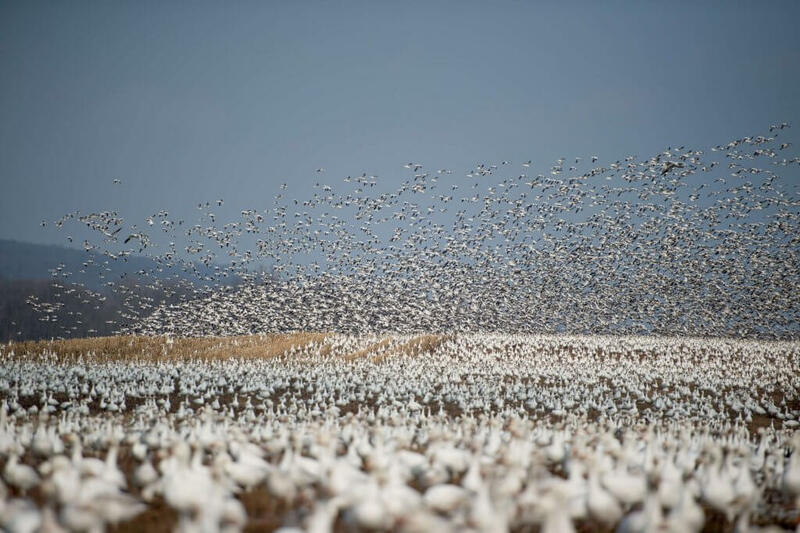 Crowdsourced content: Handle your crowd well and it will take off like this flock of snow geese. Furthermore, utilizing the crowd also has benefits for your brand. By involving your audience you are able to create a product that will be perceived as more authentic by that audience. Since they were part of the process, they are also invested in the result. Think, for instance, about how much more engaged you are in something that you helped co-create versus something you merely observed from the sidelines? That difference is the power of the crowd. Okay, so if the crowd is so great, how can you get better at activating it? Let’s start with the obvious. In order to move people to work on a problem you might have, you need to put out a call to action. Not everyone in your audience is going to respond and that’s okay. You are looking to ignite the passion and enthusiasm of a select few. As you do so, make sure to adhere to two basic principles. ● Have a simple screening process to weed out anyone who is not serious or beneficial for what you are trying to do. ● Make it easy for your audience to contribute the crowdsourced content you are looking for. Whether you are asking people to contribute to your blog or help train your AI, ensure that the process is not tedious or annoying for participants. This will increase the likelihood of their actually taking time out to help. Engaging the crowd is not always about getting a finished, polished product from the public. It should be about taking whatever you can to simplify your job. This can include building on what already exists. For example, you might find that another publisher has completed a study that informs your work but doesn’t quite address the problem from the right angle. Instead of replicating the entire study you can crowdsource data from other people’s studies to create something tailored to your needs. Spend time listening to the communities in your industry. Someones you don’t need to look much further than Reddit forums to find people who are passionate about your field, so much so that they are taking time out to answer people’s questions. Many of these people have more knowledge or experience than your own staff. Why not create a question or forum, inviting people to offer their help? Many of the largest news agencies even have crawlers scanning Reddit for new ideas and perspectives. If you clear up the rights to use that information, you could do something similar. If you are getting the crowd involved then every piece of content you produce should allow for commenting. Comments are a signal that the crowd is engaging with your content and it lets others know that it is a “popular” and therefore worthwhile project. Don’t be afraid of having different opinions to those people who left comments – that’s the point. The resulting tension creates energy that often leads to new ideas and approaches and thereby enhances the quality of your crowdsourced content. You could go a step further and create surveys or polls to better gather people’s input. Tools like PollDaddy make this easy and can directly be integrated into a CMS like WordPress. The added benefit of creating a survey is that by doing so you are creating new data that can further inform your decisions and that can be turned into new content. Though you may be active on social media that does not necessarily mean that you are using its full potential to engage the crowd. At the end of the day you want any content you produce to have the capacity to go viral. That means you need to make sure your audience is getting it, which in turn means that you need to reach out to your audience multiple times – on multiple channels. You can use scheduling tools like HootSuit or Buffer to coordinate your posts. Make sure you are using social media to both send out messages to your group and receive input and feedback from them.